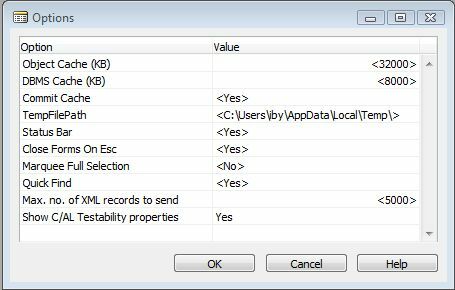 One of the new features in NAV 2009 SP1 is C/AL Testability. Before we are able to perform tests on codeunits / functions – we have to enable the Testability. This is done in Tools -> Option. Here you must set the “Show C/AL Testability Properties” to Yes. So let’s take a close look on how to build the “Handler Test Functions” codeunit. First create a new codeunit. Let us call it “Handler Test Functions”. In the Properties for the Codeunit set SubType to Test. We want to test the function TestConfirm in the doTest codeunit. Because the function contains a CONFIRM, we need to have functions that can handle the answer Yes and No. So let us build these two function. In the Global Var add the function Confirm_Yes. 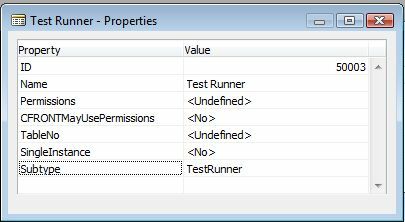 Before closing the Global Var window, select the Properties for the function and set the FunctionType to ConfirmHandler. Next is to create functions that handles the different test scenarios. Again go into the Global Vars and add the new function here. Let us start with the function TestConfirm_TrueYes. This function, should handle the Yes case. 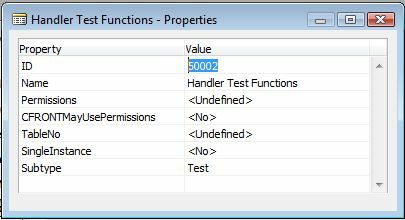 In the Properties for the function you now have to setup the FunctionType and the HandlerFunctions. FunctionType is set to Test. When FunctionType is Test – the function will automatically be executed by the Test Runner codeunit. Next set HandlerFunctions to Confirm_Yes. Now the function knows, that if a Confirm Message occurs, then use the HandlerFunction Confirm_Yes. Repeat this for the functions TestConfirm_TrueNo and TestConfirm_False. Please notice, that the HandlerFunction is Confirm_No. Furthermore notice that we in this function uses ASSERTERROR and GETLASTERRORTEXT. We are doing this, because we are now expecting to get an error back from the doTest.TestConfirm function. Now we have all test functions in place and are ready to build a test run codeunit. Let us call the codeunit Test Runner. In the properties set the SubType to TestRunner. When you now executes the Test Runner codeunit – it will automatically execute all functions in the “Handler Test Function” codeunit, that has the FunctionType Test as property. If you like to log any events that occur, you can add two functions to your Test Runner codeunit. OnBeforeTestRun and OnAfterTestRun. These function will be executed before and after each test run – a test run in our case – is equal with a function call.